Wyatt- Interesting post! I’m glad I’m not the only one who has thought about the ridiculousness of the idea that every home should have a bright green lawn in front. How many of us actually enjoy that lawn on the weekends? How many times do you see folks out on the front of their lawn, rolling around with the kids or catching a ball? 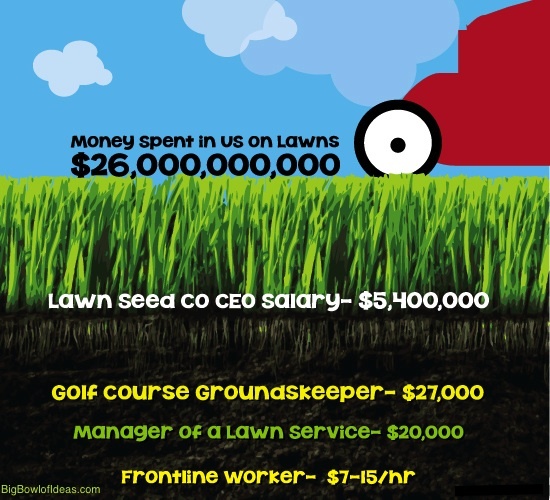 My point is that we’ve all bought into the idea of a Beautiful green grassy lawn,… and for what? It’s pretty to look at. But in my mind, especially here in sunny Southern California, where we live in a desert climate, it makes much more sense to put up some native plants that don’t require constant watering, constant maintenance and so on. We bought fake grass long ago and we love it! No watering, No Mowing!